So, remember a few weeks ago when my darling future-husband cleared out space for my sewing room? It finally happened! As soon as I got back from Boston we went straight for Ikea where I picked out and purchased items for my beautiful new sewing space. Sweet Eric stayed up all night putting everything together (I was passed out on the couch! ), and I woke up to find the most glorious space a lady could ask for. 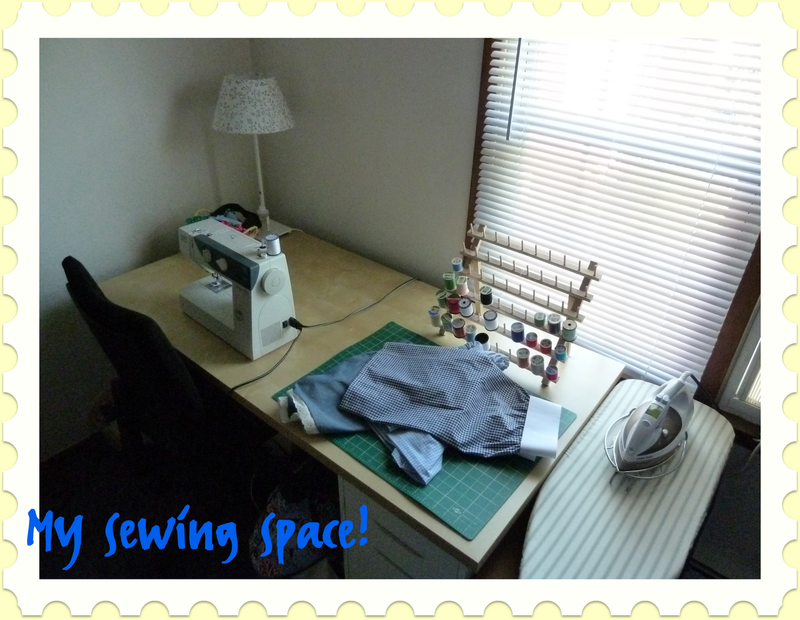 Here's a tour of my brand spankin' new space! Desk: I knew I wanted a birch top for my desk, and white legs, with drawers. 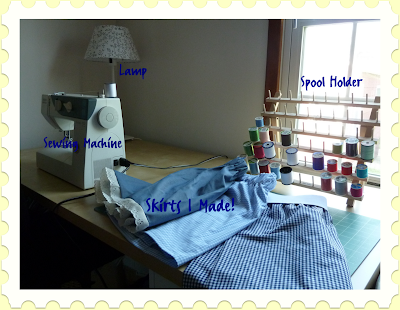 I love these drawers, they hold the perfect amount of sewing things. Lamp: I wanted a very light and breezy feel to the room so I stuck with a basic white lamp base. I fell in love with the simple design on the shade; the basic floral lines add a touch of femininity to the lamp. Chair: I knew I didn't want to spend a ton on a chair, so luckily this chair was $60 and had a back that was perfect for sewing (stable and very upright). It's comfortable and I liked that it had no arms (makes it easier sewing for me, for some reason). 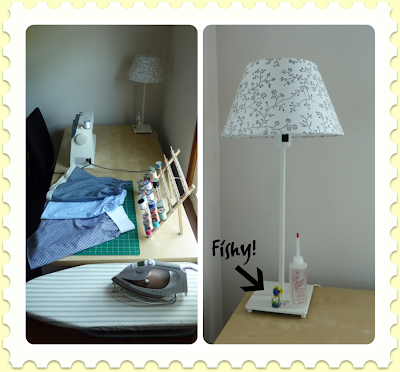 Ironing table: The ironing board is a table-board from Target, and the table is actually a piece from Ikea. Eric used it as a side table in his old apartment, and it fit the ironing board perfectly. Also, there's some storage in the side table for fabric. Machine: Duh, I forgot to introduce the main star of this show: Pfaff, my machine! My grandmother bought this for me in college and it's come many places with me--now it has a home of it's own! Spool holder: While Mother's Day shopping at Michaels (what? doesn't everyone do their Mother's Day shopping there?) we came across this great spool holder. I love that it's wood and keeps with the light wood theme of the room. Little Fish: My mother bought us all little tiny glass animals for Christmas; she got me this fish because I'm a Pisces. I love keeping this fish here because it's actually held up by a wire, so it bobs up and down while my machine runs. Where is the little fish ?